The buttons are divided in 2 pages, press the button with the arrow to open and switch between pages. 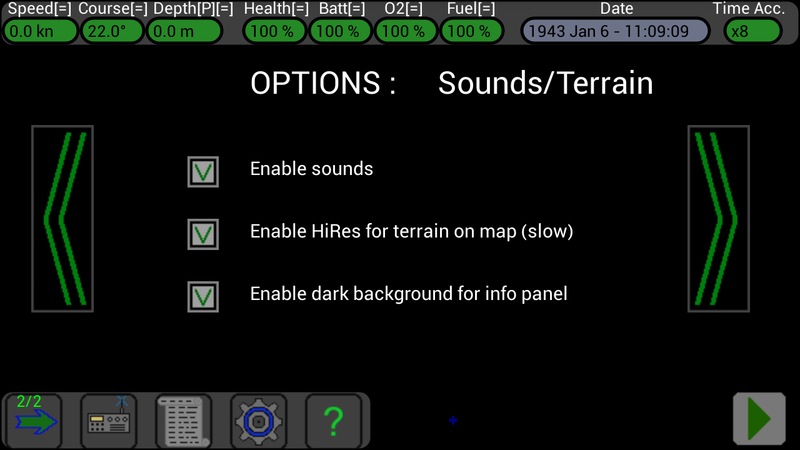 Push again the map button to hide the terrain. 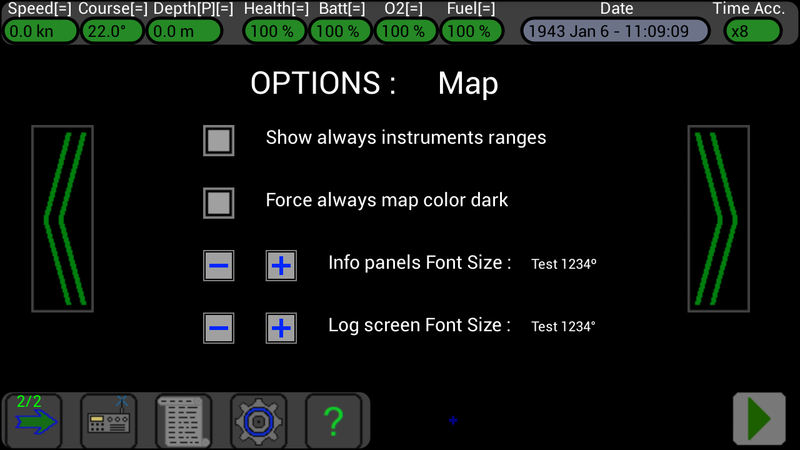 Note how its icon changes when the terrain is shown or not. 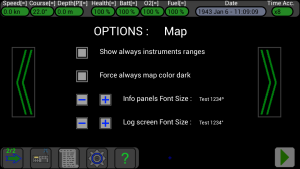 Note: to avoid using a really large amount of memory in your device, the terrain’s points are interpolated in real-time when the map is moved or zoomed and this intensive task could cause a slowdown of the user interface; it is possible to reduce this effect by disabling the option “Enable HiRes for terrain on map“, and the terrain will be drawn at a lower resolution in the map. Click here for a detailed description of these windows. 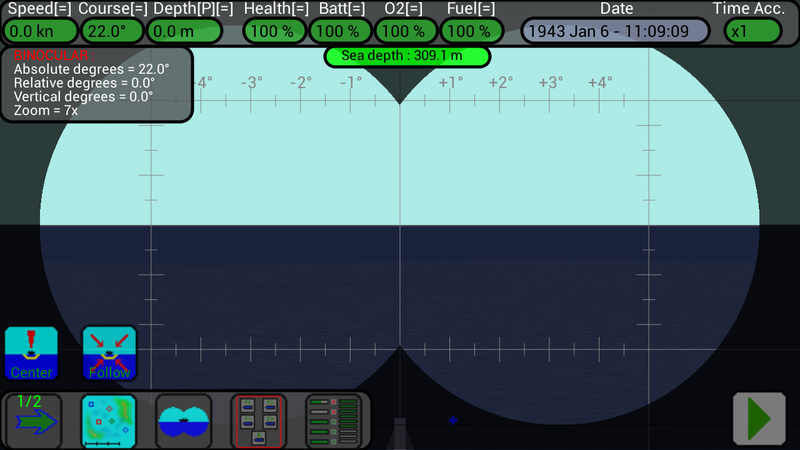 Press again the same button to close the Torpedoes Course Offset window. These windows have the buttons to launch the torpedoes, to set their course and the buttons for the deck gun and the AA gun. 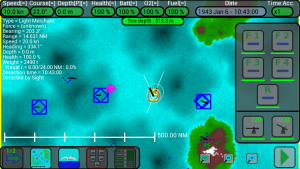 Click here for a detailed description of how to launch the torpedoes. Click here for a description of the Deck Gun. 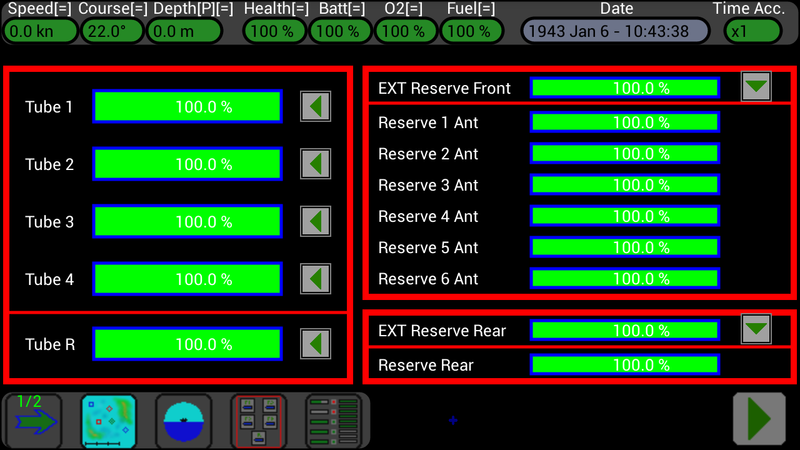 Click here for a description of the AA Gun. 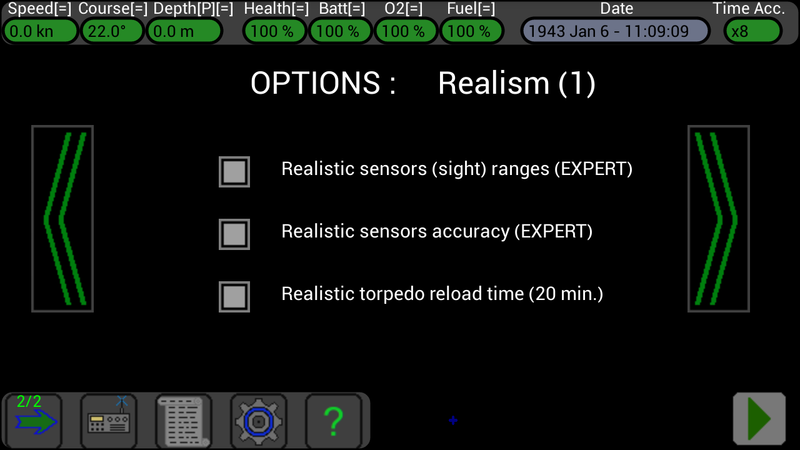 In this screen you can check the status of torpedoes and you can reload the torpedo tubes if they are empty. 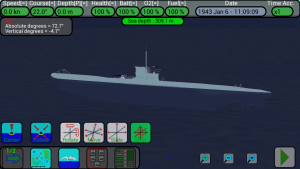 The submarine can contain 14 torpedoes, 5 inside the torpedo tubes and 9 others in reserve (backup). 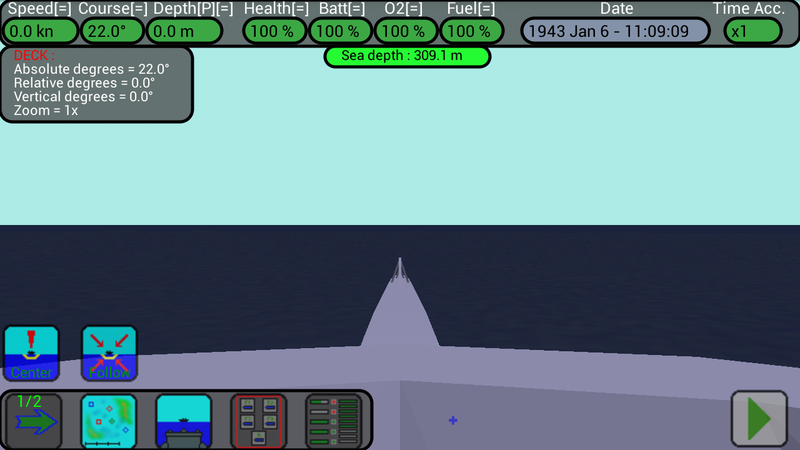 4 tubes are in the front of the submarine and 1 tube is in the rear. 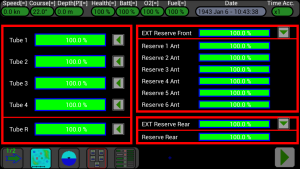 The 9 backup torpedoes are so divided : 6 inside the submarine in the front (Reserve x Ant), 1 inside the submarine in the rear (Reserve Rear), 1 external to the submarine in the front (Ext Reserve Front) and 1 external to the submarine in the rear (Ext Reserve Rear). 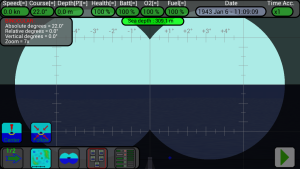 The 6 backup torpedoes inside the submarine (in the front) can be used only to reload the 4 tubes in the front of the submarine. 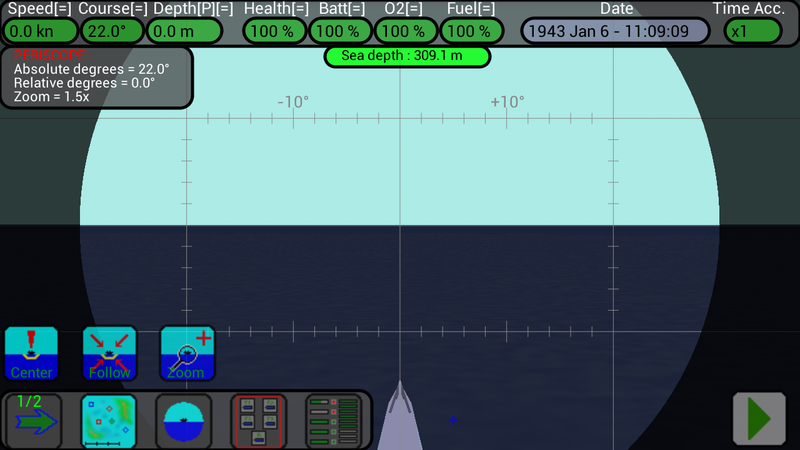 The other backup torpedo inside the submarine (in the rear) can be used only to reload the tube in the rear. The backup torpedo external to the submarine (in the front) can be moved inside the submarine (in the front), and the backup torpedo external to the submarine (in the rear) can be moved only inside the submarine (in the rear). 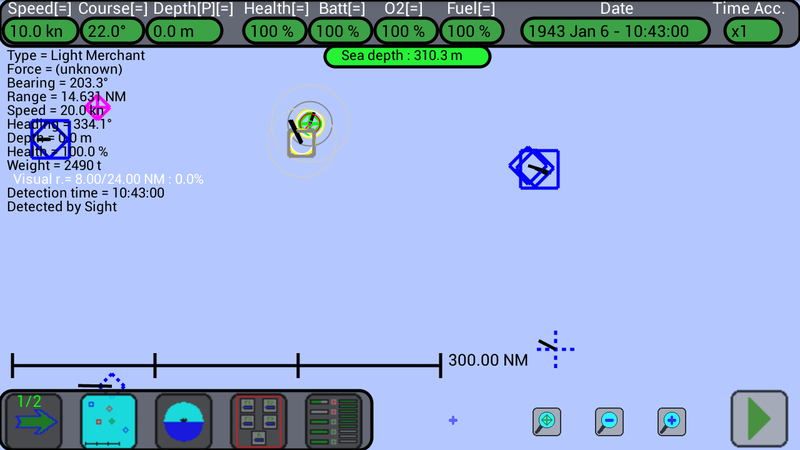 In practice, during the game, you can launch 11 torpedoes from the 4 tubes in the front of the submarine, and you can launch 3 torpedoes from the tube in the rear of the submarine (torpedoes in the front of the submarine can not be moved to the rear, and torpedoes from the rear of the submarine can not be moved in the front). 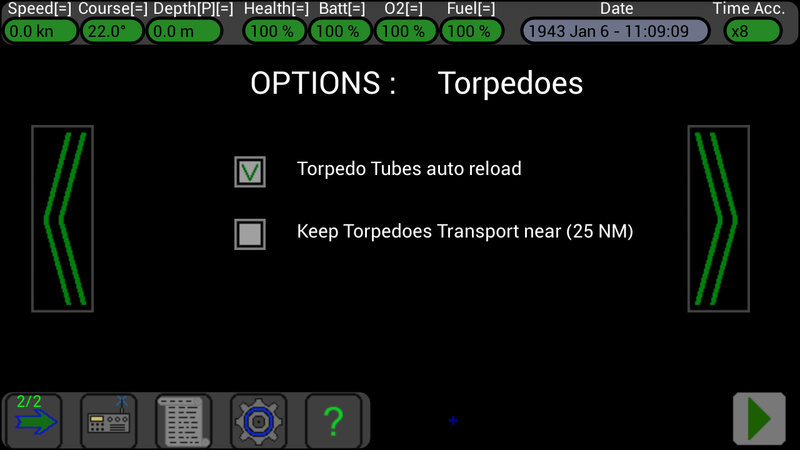 At any moment you can call the Torpedoes Transport to resupply your torpedoes (only in the Full version of the game). 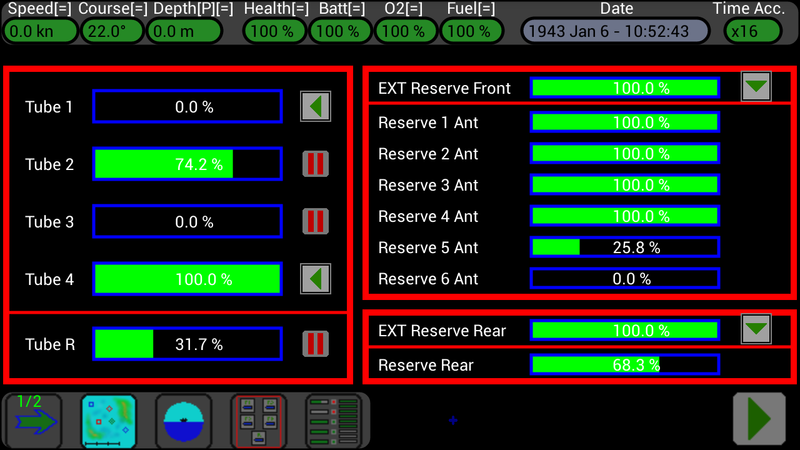 In the picture above you can see on the left the 5 torpedo tubes, 4 front (Tube 1,2,3,4) and 1 rear (Tube R), the green color and the percentage to 100% indicate that the tubes are full and ready to launch. If the rectangle of the tube is black, and the percentage is 0%, it means that the tube is empty. 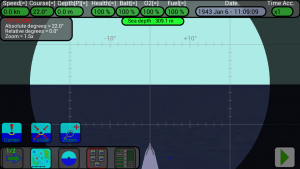 If the rectangle of the tube is partially green and the percentage is greater than 0% and less than 100%, it means that the tube is in charging. 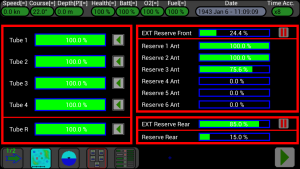 On the right side you can see the 9 torpedoes of reserves that serve to reload the torpedo tubes, the rectangles are filled with green indicating that the torpedoes of reserves are present. If the rectangle is black, it means that the torpedo reserve is gone. 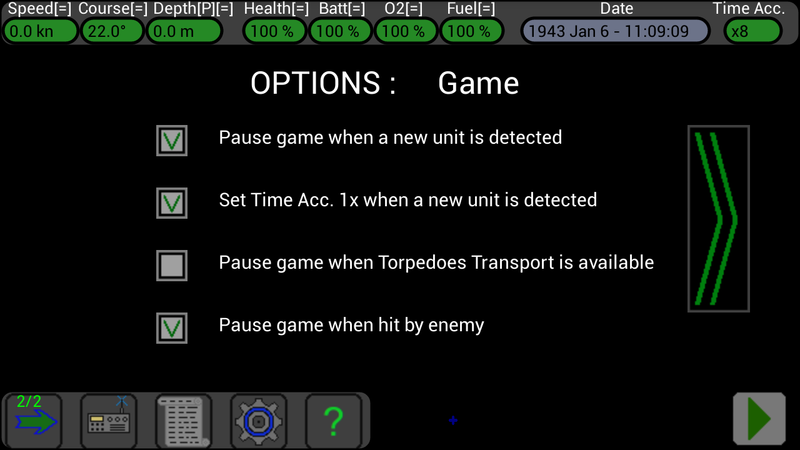 In the middle there are the 5 buttons to press to reload the torpedo tubes, when a tube is empty you can press the button to order to charge it, the button icon will change and will contain two red bars to indicate that the tube is being charging or waiting to be reloaded. You can order to charge more tubes at a time, but charging takes place on a tube at a time. 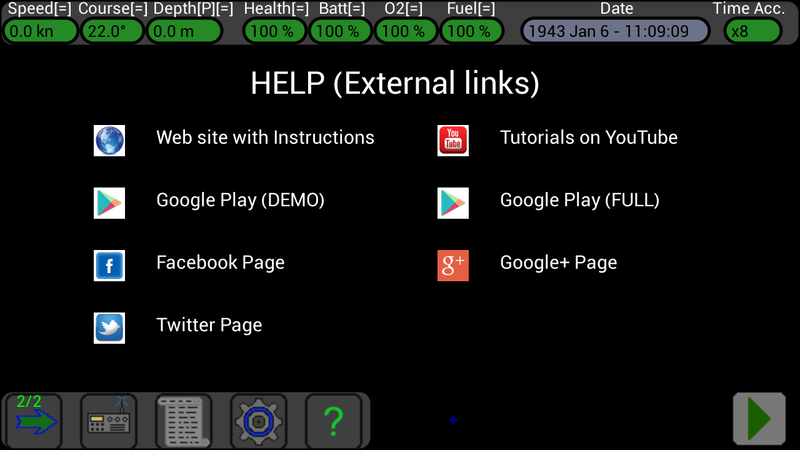 When the tube has been reloaded, the icon of the button will return as before with the green arrow. If you want you can pause the charging of a tube by pressing the appropriate button. 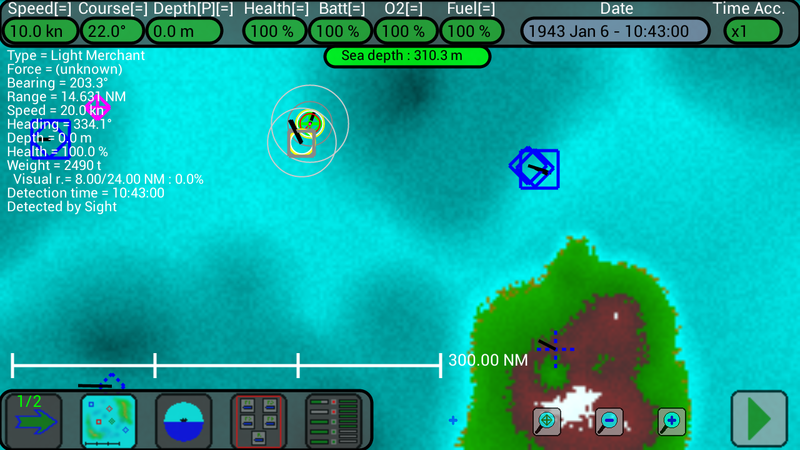 Note: you can always reload a tube when a backup torpedo is present (when you are at surface, in depth, stationary or moving), except when the Torpedoes Transport is linked (because the crew is busy). If a tube reloading is in progress, the Torpedoes Transport can not link to your submarine. 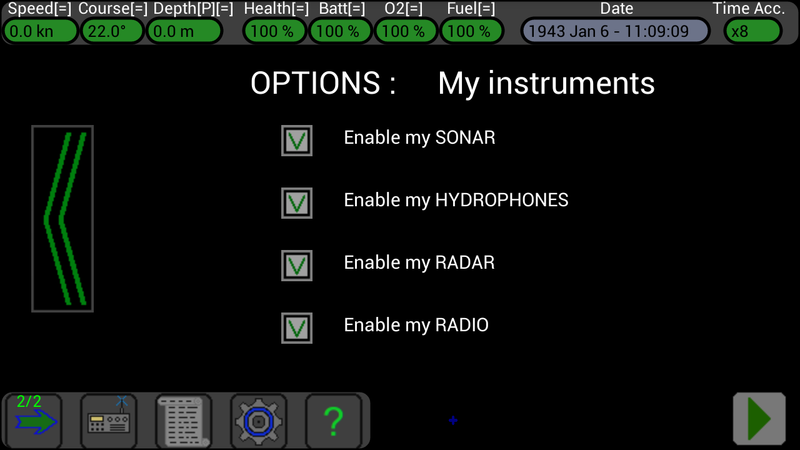 In the right side of the screen there are 2 more buttons, these are used to move the 2 external torpedoes inside the submarine. 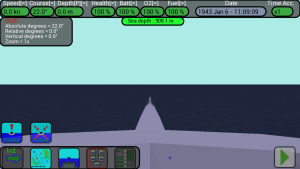 IMPORTANT: you can move the external torpedoes inside the submarine ONLY when you are at surface. 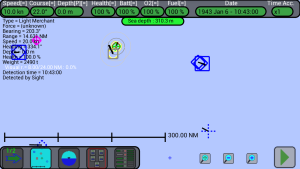 When an external torpedo is moving inside the submarine, the submarine CAN NOT go to depth until the operation is terminated, so be sure to not have enemies around !!! It’s better to move this torpedoes during night (when airplanes don’t attack). 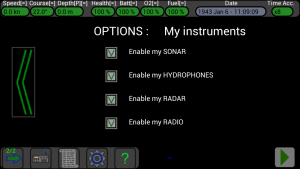 On the left of the screen we see that the tube 1 is empty and the button close to it with the green arrow indicates that you can order to recharge it. 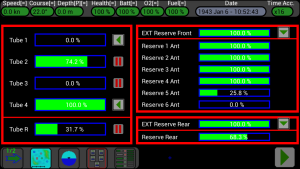 The tube 2 is being charged (74.2%) and the button with the red bars indicates that it is possible to pause charging. 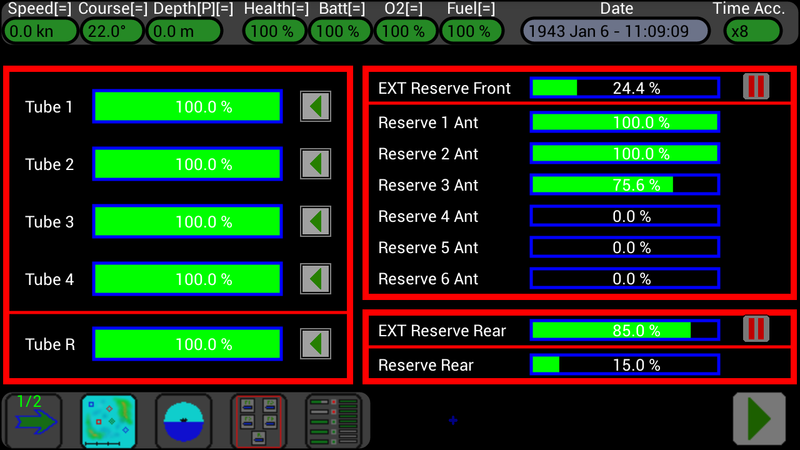 The tube 3 is empty (0%) and the tube 4 is full (100%). The rear tube is being charged (31.7%). On the right of the screen we see that the Reserve 5 Ant (25.8%) is going inside the tube 2 and the Reserve Rear (68.3%) is going inside the rear tube. The Ext Reserve Front (24.4%) is going inside the Reserve 3 Ant (75.6%), and the Ext Reserve Rear (85.0%) is going inside the Reserve Rear (15.0%). Note: you can manually order to reload a tube or to move an external reserve inside the submarine using the buttons in this window, or if you prefer you can enable the option “Torpedo Tubes auto reload” to reload automatically the tubes when they are empty. 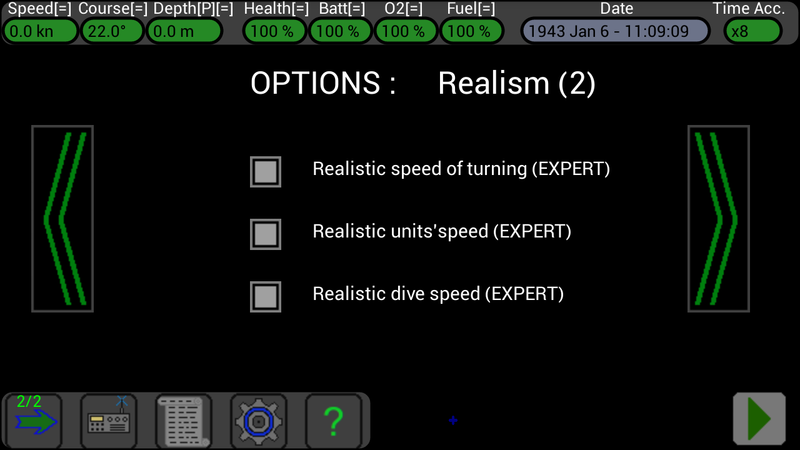 Note: the external reserves can be moved inside only manually using the buttons; the “Torpedo Tubes auto reload” option doesn’t do this, because this operation forces your submarine to stay at surface and it can be dangerous if enemies are around. 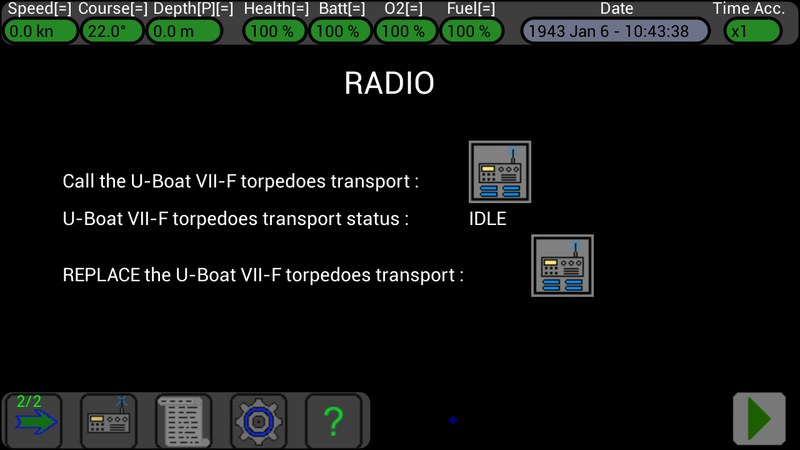 There are 2 buttons inside this window : the first is for calling the Torpedoes Transport, the second is for replacing it with a new one (in case it was blocked by a land mass and you had no way to meet it). Click here for a detailed description of how to call the Torpedoes Transport. 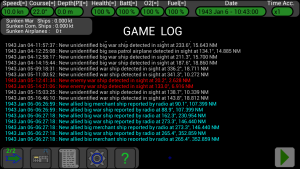 Here all game messages are shown, the window is scrollable and they are saved and loaded with the game. 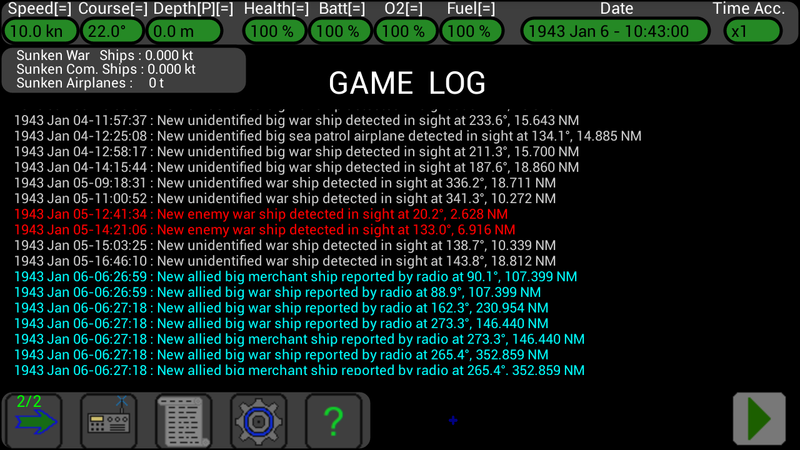 Note your game score at the top-left of the screen. Press this button to open the Options screen, where there are selectable options to control the game behaviour. 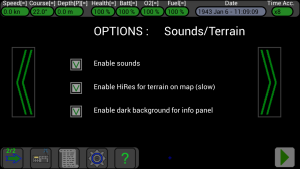 Note: some options are available only in the Full version of the game. 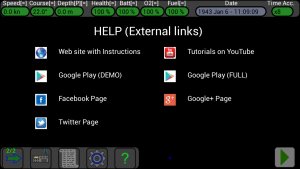 Press on the icons to activate the links (an internet or wi-fi connection is needed). 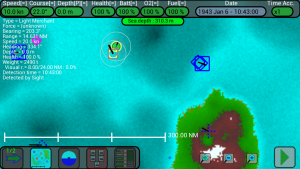 The icon of this button contains a green arrow when the game is paused (the date and time are stationary), the game is resumed by pressing it and the button changes icon (red bars). 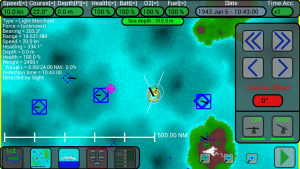 The icon of this button contains two red bars when the game is in progress (the date and time are constantly changing), pressing it will pause the game and change the button icon (green arrow).